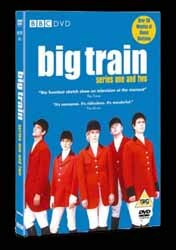 Written by Graham Linehan and Arthur Mathews, the writers of Father Ted, Big Train was the winner of the Bronze Rose at Montreux after the first series was transmitted in 1998. But it wasn't until 2002 that the much anticipated second series was screened. The show twists everyday occurrences and mundane situations into daft sketches and improbable scenarios such as the world premiere of the influential film classic, Alfred Hitchock's The Working Class - the stuff of nightmares; the pros and cons of having huge hands when using today's micro technology; shy policemen, confused Ministers, ducks in danger and hens in armed combat. I have to be honest and confess that I missed this series when it was originally screened. Actually, I say missed, I mean avoided. The reason that I didn't much care for this series was due to some very poor trailers that just didn't look funny. However, I now realise what a classic series I missed. Some of the highlights include Mark Heap's juggling (incidentally the ending to this sketch reminded me of the Monty Python sketch The National Hide and Seek Champions); Fox hunters sketch (even funnier when you consider that the fact that the practice is soon to be outlawed and we may well see them looking for other, less gory pastimes; and a great sketch were parents and kids swap places during a car journey. Having said that, it's almost impossible to list your favourite gags - there are just so many comedy moments to choose from. Extras on this double disc collection include audio commentaries with the writers and cast, and some deleted sketches (most of which are very funny). A hoot (ha! ha! do you get my hilarious train reference) from beginning to end.